This guide is intended to describe installation options you would use in residential installations. If you are a professional installer, remember to include the cost of installation and support when quoting your project. How many devices require IR control? NoYes Do you want to watch full screen video on your Android mobile devices? A NetPlay distribution system is a "virtual matrix" switch. You can add as many sources and displays as needed. Because NetPlay is a "decentralized" system, your sources do not need to be grouped together in a single location. 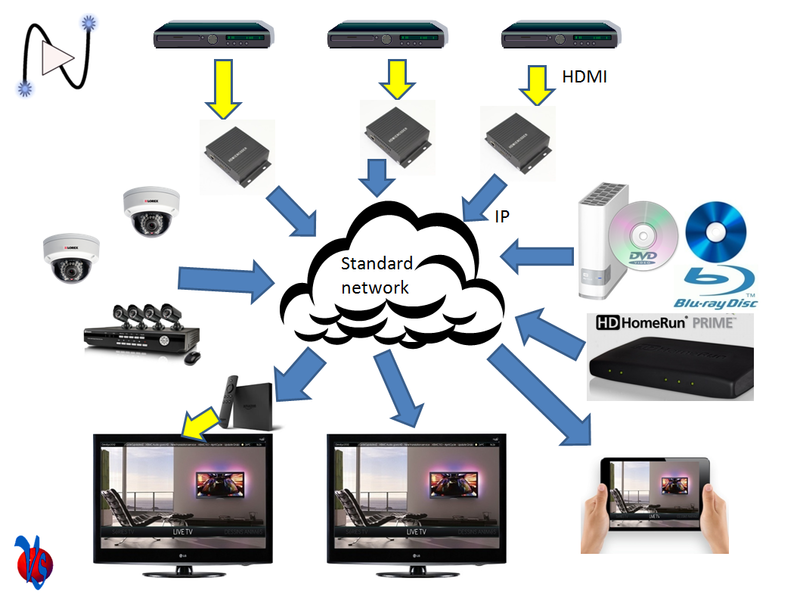 Live HDMI Sources: NetPlay Home uses network HDMI encoders to bring all your "live" HDMI sources into the matrix system. This will be any source device with a HDMI output that does not fall into the directly integrated categories below. Use NetPlay Ready encoders for each of your HDMI sources. GoogleCast/ChromeCast Sources: All supported NetPlay TV devices include support for GoogleCast/ChromeCast. Either audio or Video can be directly streamed to any display from Android devices. Mobile players: Mobile devices (such as tablets and smart phones) can play back NetPlay video sources directly. 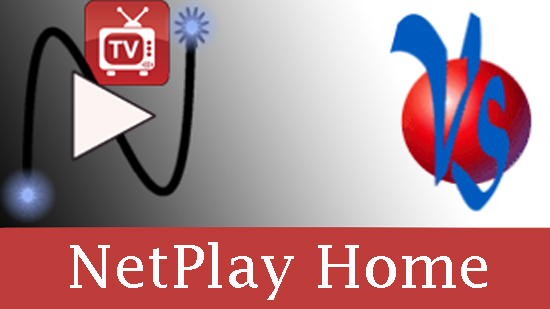 NetPlay Home NetPlay Manager includes the required license for control and video preview on all your mobile devices. Full screen playback on mobile devices requires a supplimental license purchase. Your NetPlay Home display devices will receive synchronized audio via the same network stream as the video. This audio is always present on the HDMI output, but some devices may also have optical or analog outputs. Simply route the audio to your TV speakers or AVR just like any other source. You can also use extra NetPlayTV decoders to provide synchronized audio at any location. If you are using a fully "centralized" audio solution with in-wall/ceiling speakers that are hard wired back to a central equipment rack, please use CMX1616A2. For full details on system control, please see NetPlay system control options. NetPlay Home integrates Ethernet, IR, RS232, and CEC control for all your connected source and display devices. This control is provided either via NetPlay Mobile app on your Android Mobile devices or directly at each TV using the NetPlayTV gui itself and the included remote controls. In fact, both control methods can be used at the same time by different users. NetPlay TV devices with USB ports can use IRUSB to provide direct IR control of the attached TV, speakers, or AVR. IRUSB also provides full centralized IP control (menu navigation, app launching, playback control) of your NetPlay decoder devices. NetPlay Manager can use IRUSB to provide direct IR control of your HDMI source devices. 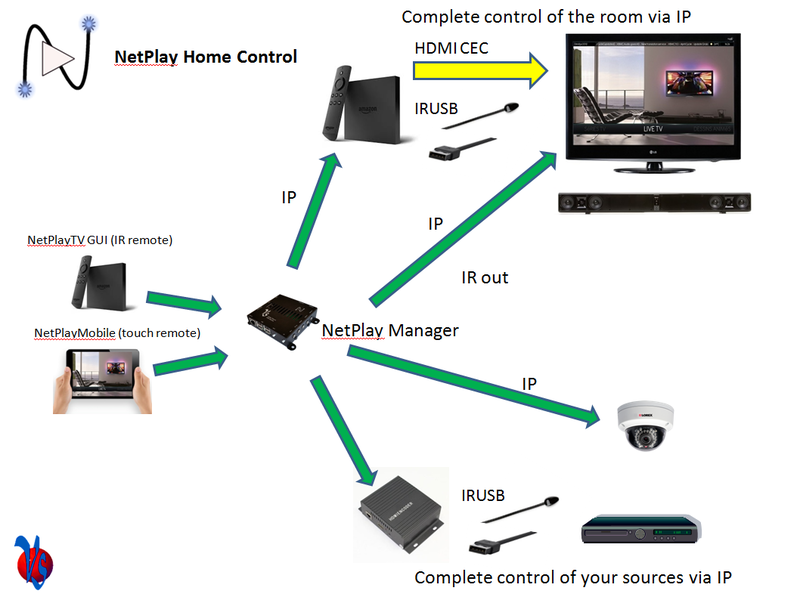 NetPlay Home can also be integrated in third party control systems using our existing drivers. 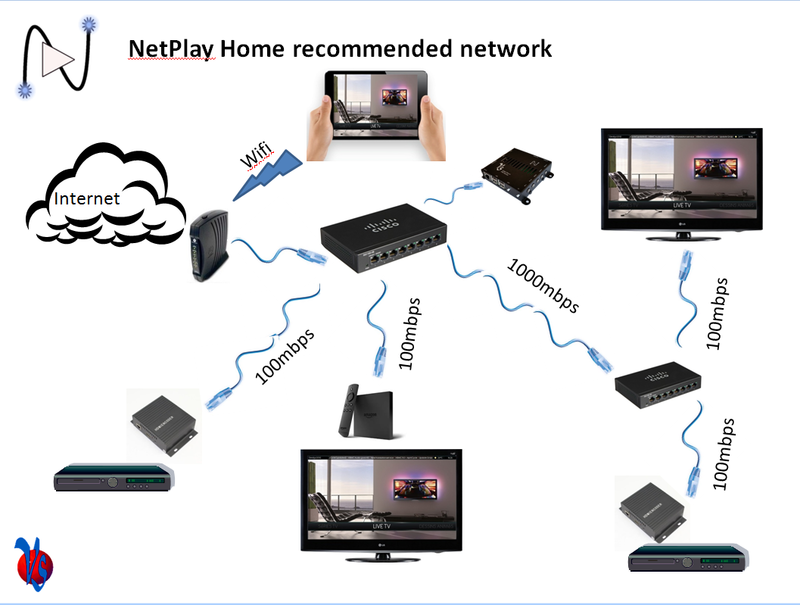 NetPlay Home uses your standard home network for audio and video distribution. The network switch or switches will need 1 port for each NetPlayTV display and 1 port for each network HDMI encoder. Switches can be cascaded as needed, but make sure the interswitch connections are 1000mbps. 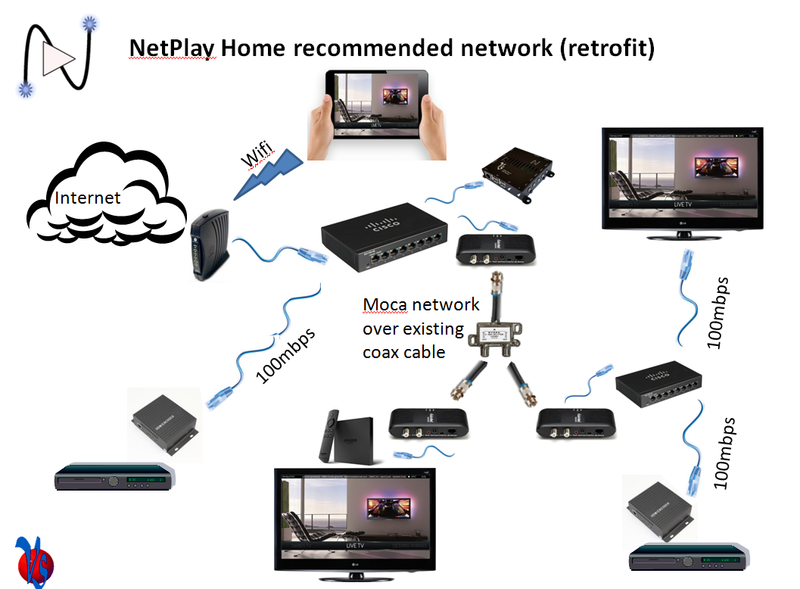 NetPlay can use the same network as all the other devices in your home. The network router will need a DHCP server enabled (this is default on nearly all routers). The network switch ports connecting to network HDMI encoder devices should be 1000mpbs capable. The ports for NetPlay TV devices should be 100mbps or higher. Most switches support both speeds. All NetPlay devices should be on the same subnet if possible. If this is not possible, routing rules must exist between the subnets. VLANs are not required or recommended. Devices should have access to the internet for app updates or cloud streaming.